Infor VISUAL Support Tips & News: Did you know that you can add customizable UDFs to many windows in Infor VISUAL? 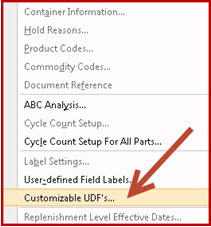 Did you know that you can add customizable UDFs to many windows in Infor VISUAL? 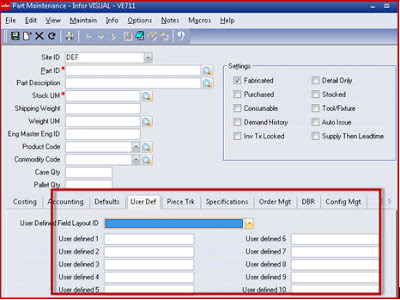 Many installations of VISUAL utilize the basic User Defined Fields that have been available starting in the early releases of VISUAL. But did you know that there is another layer of UDFs? These are called Customizable UDFs, and I’ll give a quick look at some this functionality. I’ve included a list where these customizable UDFs are available at the end of this message. For this example we will be in Part Maintenance. 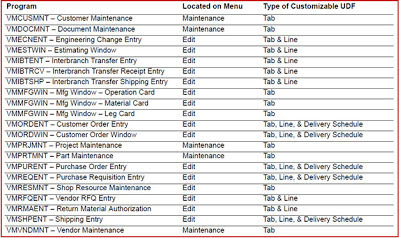 Most of us are familiar with the standard User Defined Fields shown below. Here is an example of the screen that allows you to enter and edit these UDFs. I have added two new tabs to the part maintenance window. The result is shown in the second image. As you can see, I have added two new tabs. Each of these tabs has many more options than I will cover here. For example, you can make these required fields and give a specific set of values to choose from. 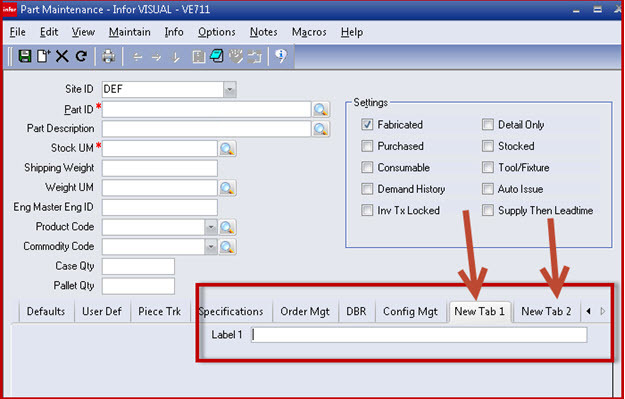 While VISUAL does provide a large number of places to store information in the standard windows, you do have these Customizable User Defined Fields available if they are needed. Below is a list of windows where these are available in release 7.0. This VISUAL Did You Know tip was brought to you by BizTech VISUAL Consultant, Larry Tussing.